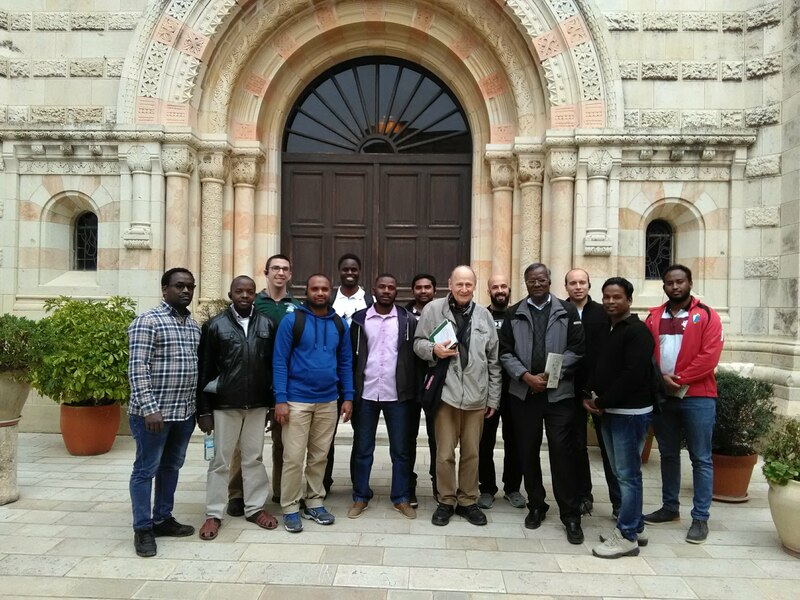 February 8 2018 - Mt Zion - Jerusalem On Thursday February 8th 2018, the first-year students of STS, as well as the Director of the Salesian Community and a 4th year student, were guided by Fr. Pol Vonck M. Afr. to the Holy Sites of Mt. 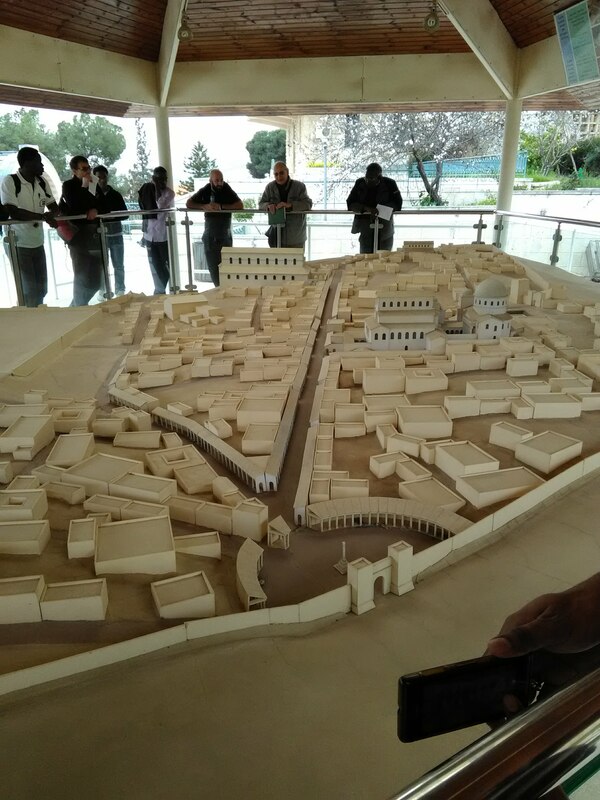 Zion in Jerusalem. The visit began at Zion gate in the afternoon and then we walked to St. Peter’s in Gallicantu. St. Peter’s is venerated as the place where Jesus, after being arrested, was imprisoned awaiting his upcoming trial and where pilgrims reflect on the denial of Peter. It was beautiful to pray together as a group in that space and to reflect on the life of Christ. The three-tiered church has a very prayerful atmosphere, in part by the memory attached to the place, but also because of the many icons that decorate the walls. The visit proceeded to the over-look of the panoramic view of the Kidron Valley, the Temple Mount, Mount of Olives, the City of David and Gehenna. 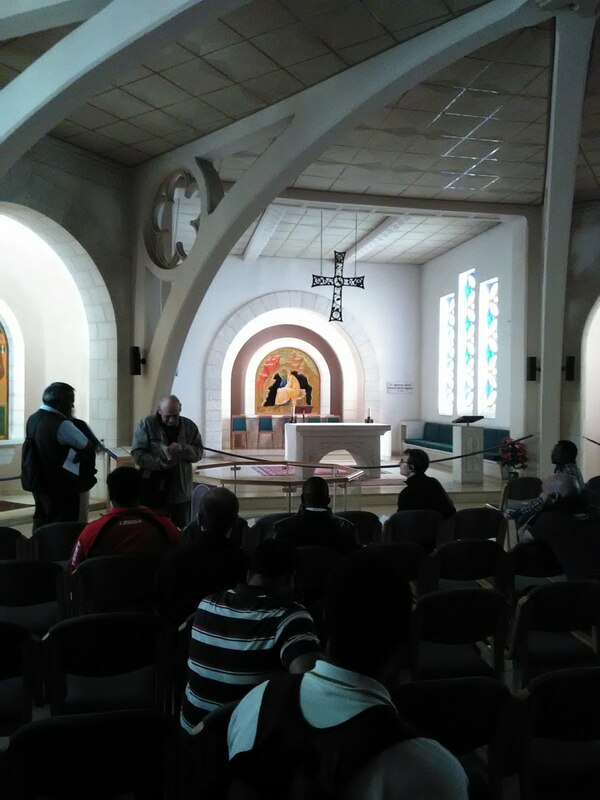 From there we hiked up in order to visit the Tomb of David, the Cenacle and Dormition Abbey. Although many of us in the group had already visited many of these places on our own, Fr. Pol brought a wealth of knowledge that helped deepen our love and understanding of our Christian tradition. For example, he took us first to a small cloister that used to be the dwellings of the Franciscans, but also the place where many scholars locate the walls of the 1st century church of Hagia Sion. The place where we stood could very well have been the place where the first Christians gathered to break bread. 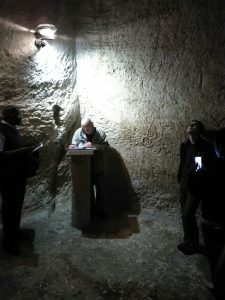 Whether it was that exact wall or that exact place, the possibility of even being in the vicinity of the first Christian church was quite overwhelming. Each holy site brought with it a similar experience, I’m sure different for each one of us, but none the less impactful. 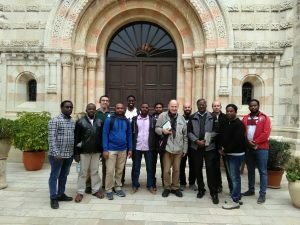 We completed our visit to the Dormition Abbey, and although many of us were tired, we were able to appreciate the beauty of the Church as well as the crypt where the statue of Mary and the many side altars gave us time to reflect on the tradition of how Mary’s earthly life ended; the great and glorious mystery of the Assumption. Our mini pilgrimage to the sites of Mt. Zion gave us a better understanding and appreciation for our faith, as well as more “food” for prayer that will nourish our future visits.